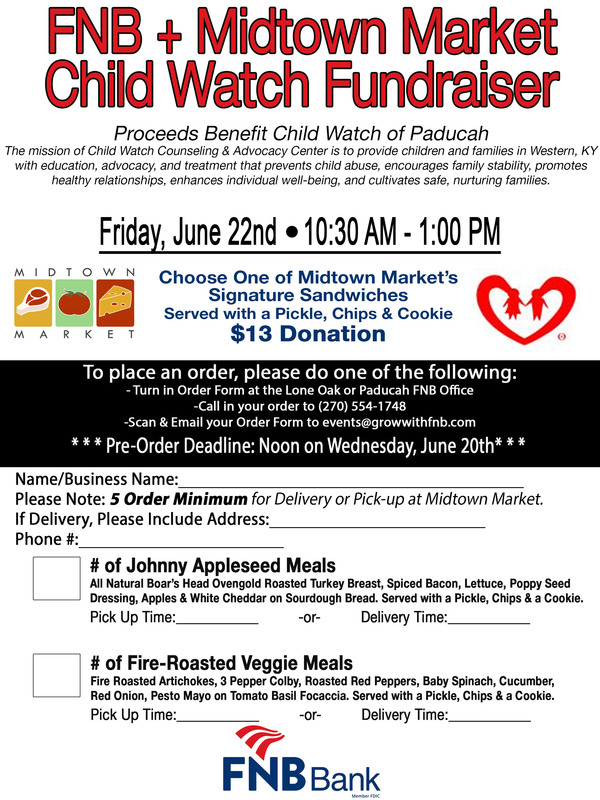 FNB is teaming up with Midtown Market for a Fundraising Lunch on Friday, June 22nd to benefit Child Watch of Paducah! For a $13 donation choose one of Midtown Market’s signature sandwiches- the Johnny Appleseed Sandwich or the Fire-Roasted Veggie Sandwich. Each is served with a side pickle, chips and a cookie. There is a 5 order minimum for delivery in Paducah or orders can be picked up at Midtown Market between 10:30 AM and 1:00 PM. All proceeds from this event will benefit Child Watch of Paducah. The mission of Child Watch Counseling and Advocacy Center is to provide children and families in Western, KY with education, advocacy, and treatment that prevents child abuse, encourages family stability, promotes healthy relationships, enhances individual well-being, and cultivates safe, nurturing families. To view the printable order form click here.